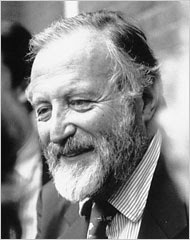 Edward Goldsmith, who passed away a few years ago, was quite famous in England, where he founded The Ecologist in 1970 and was instrumental in the creation of the Green Party. The Way: An Ecological World-View is his grand summation; it took him twenty years to write, and with appendix and bibliography is 500 pages long. It is not well-known in America, where the University of Georgia Press publishes it. I first saw the book mentioned in The Revenge of Gaia, by James Lovelock. Lovelock was listing plans to combat catastrophic climate change, including spraying particulate matter in the atmosphere and building a sunshade in space. After several increasingly terrifying proposals, Lovelock took a step back and said that, since we couldn't possibly predict the consequences of such massive bioengineering projects, it might be better if we returned to the kind of modest, responsible lives our ancestors once lived, as his friend Edward Goldsmith recommended in The Way. I decided immediately to go out and read it, since this seemed like a saner strategy than blocking out the sun. The Way is a book for determined readers. First of all, to get past the first few chapters, you pretty much need to already be convinced of several things: that we are on the brink of an ecological collapse; that the past two hundreds years of industrial development have been a doubtful blessing for humans and the environment; and that we need to learn a great deal from certain pre-industrial societies and their relationship with the planet if we want any chance at decent survival. Even if you are convinced of these things, and I am, Goldsmith does not make your work easy. You have to push through a mass of neologisms – heterotelic, chreods, homeorhetic – which only gradually sink in and then begin to seem useful. The early chapters are filled with cross-references – one page in chapter two, for example, refers a reader to five other chapters as well as the appendix for further development of ideas. It can seem like a maddening tangle. This tangle, even if it might not be the best way to attract an audience, does end up serving a function. I think The Way is trying to be non-linear, associative, and extensively inter-linked as a mirror of the ecological worldview it is trying to describe. Each chapter is named after a certain principle – for example, “Natural systems are homeostatic” – that is less a link in an argument than a point in a constellation (most chapters are only a few pages long). Goldsmith wants to show how everything is connected – from the move away from early Earth-based religions to the breakdown of modern urban communities – and he jumps continually from one subject to another. The connections between these areas are not usually defended with statistics; they simply exist together in space, and the lines form between them (if they do) through a kind of intuition. Science (he writes) has not banished faith. It has substituted faith in modern science for faith in conventional religion. Ecology, with which we must replace it, is also a faith. It is a faith in the wisdom of those forces that created the natural world and the cosmos of which it is part; it is a faith in the latter's ability to provide us with extraordinary benefits — those required to satisfy our fundamental needs. It is a faith in our capacity to develop cultural patterns that can enable us to maintain its integrity and stability. Unfortunately, Goldsmith forgets that certain citadels do not fall easily to the weapons of faith. He opens the book by trying to take down what he sees as the reductionistic assumptions of modern science. It is an attempt filled with logical holes that even a sympathetic reader can't fail to notice. Goldsmith begins by bringing up various mathematical models used in ecology, and points out that they cannot capture all aspects of reality (no one expects models to do this). In criticizing the Markovian mathematical formula used to predict ecological succession towards climax, he doesn't bother to indicate just what crucial aspect of reality is being left out. He attacks the neo-Darwinian explanation of evolution brought about through random mutations, but can't explain by what other mechanism it might take place. Look at the word that I used, though, quite unconsciously: “mechanism.” These are the only kinds of explanations that most people accept as sound: cause-and-effect, the domino hitting the next in the line. But most natural processes do not work in this way. Goldsmith provides fascinating examples, like the relationship between salmon and mosquito larvae, and lays out the staggering array of complicated feedbacks and influences on what would seem to be a simple correlation. Goldsmith cannot supply the kind of evidence that would satisfy this part of my brain. A similar sense of intellectual dissatisfaction occurs when theologians argue with atheistic philosophers, or intelligent design advocates with Darwinists. The former simply look stupid: they do not have an explanation to duel with the other one, only a sense that something crucial is being left out of the other's world-view - and while I might still crave such explanations, I'm not so sure that they're wrong. So an ecologist won't be able to say exactly what a new chemical will do to our bodies and to the natural world over the next hundred years. Instead, she might counsel a spirit of caution before we introduce substances with no precedent into our ecosystem. And she will inevitably seem muddleheaded in comparison to a scientist who has run laboratory tests that find no evidence of harm, until twenty years later people find that all of the earthworms are dying – or the bees – or the swallows – and that this is having unexpected and cascading consequences for the biosphere. It is only when the network begins to collapse that we can see how we have disturbed it. And then, maybe, we begin to learn a little humility. As Tim Parks said in our old interview, people aren't convinced by reasons; they become convinced when the bad news starts to pile up. As the modern belief in endless progress and constant development through technology yields increasingly useless marvels to go along with mounting environmental catastrophes, people, little by little, are beginning to consider other visions of being. Goldsmith's instinct is to look back to what he calls “vernacular societies” – from the ancient Greeks to Vedic Indians to African tribesmen – and draw inspiration from their ways of life. He doesn't spend time considering the possibility of limitless green energy through various as-yet-uninvented technologies. He writes, quite reasonably, that it is presumptuous "to postulate an ideal society for which there is no precedent in the human experience on this planet and whose biological, social and ecological viability has never been demonstrated." Instead, the book provides examples of how philosophy and ritual helped keep these small human communities, both hunter-gatherer and agrarian, in balance with their environment for thousands of years. These models are not likely to suggest any practical steps to the modern reader – the divergence between the societies he describes and ours is simply too huge – but I'm glad that Goldsmith insisted on following his ideas to their natural conclusions. It gives the book a certain purity of spirit. Few people could hope to live up to this spirit (and certainly not a man typing away at night on a laptop) but it remains a true ideal, one that we can keep striving to make manifest in our various impure ways. Remember, though, that animals love the hollows of a tree – a gnarled trunk will always be more full of life than a smooth one. The Way is stuffed with a lifetime's reading, crankiness, and ideas both deeply felt and poorly defended. I finished it a month ago, and have found myself continually flipping back to odd spots and finding more and more to explore. If the world created by the carpenters and their measuring lines doesn't strike you as a satisfactory place anymore, it is worth your time. This is a great, thoughtful and nuanced review, thanks for sharing it.